So by now I think it's obvious that I love cooking - I love experimenting with new things and tasting my creations. But my absolute favorite thing about cooking is being able to share all of that with others. Last night, my good friend Beth came over for wine, risotto, American Idol, and LOST - doesn't that sound like the perfect evening? We were talking and cannot believe that we have known each other for over 10 years! She reminisces about our food quirks and experiences in her blog, and my favorite still has to be the story from Denver. That was my first trip with Beth, only my second for the company, and is definitely the one I'll never forget. I learned so much that week - most importantly that the buckles on your luggage can also be used to open beer bottles in a pinch! Ok, back to the food. Beth and I both love risotto and keep talking about going to Risotteria in NYC, but for tonight my homemade risotto would have to do. 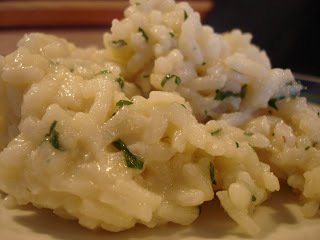 I made my garlic-parmesan risotto with black truffle oil, but I am determined to one day buy a real black truffle and shave it on top of the risotto! Cooking risotto requires constant attention and stirring. - Add the chicken broth (1 ladle) and stir until all of the liquid is absorbed. Repeat this until you have used almost all of the broth - it should take about 17-25 minutes. - When you add the last ladle of broth, also add the parsley, but only let the broth absorb halfway and then add your cheeses. Optional: Top with 1-2 tablespoons of black truffle oil. That last step is something I've played with and is my key to a creamier risotto. Also, I love drinking the wine that I used in the risotto. Last night it was a bottle of Clos du Bois Chardonnay. We were so caught up in the food and wine and the fact that American Idol was starting that I forgot to take a picture, so the picture I posted is of leftovers. You can be sure that I'll be heating them up for lunch soon! I made this a couple of days ago and it was fantastic! Thanks!